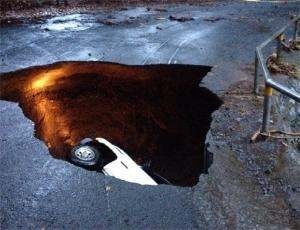 Sinkholes in Hawaii are natural or created by pressurized broken underground pipes and along with lava tubes, are a definitive part of Hawaii’s landscape . The physical processes that have helped to form this unique landscape have taken place over hundreds of millions of years. Hawaii Private Locators LLC uses sophisticated electromagnetic detectors utilizing radio frequencies and electromagnetic signals, and ground-penetrating radar to sense underground pipes, utility wires, lava tubes, old septic tanks – cesspools, or other potentially hazardous sink holes and voids. Depending on the soil condition, this technologically advanced equipment could also be able to detect Hawaiian iwi so potential burial grounds will not be disturbed.